Polk County Farm Bureau welcomes partners to support year-round educational opportunities offered to our member –families, agribusiness and related industries. Includes full sponsorship of the 75th Anniversary Celebration and Membership Meeting in October 2017. Diamond sponsors are exclusively eligible to receive 10 minutes of podium time at the event. Also includes logo on invitations mailed to over 700 active farmers, logo on event program, banner displayed at event, and 8 tickets to attend. Up to six (6) “SPONSOR NEWS” community share postings on PCFB website and Facebook page. Four (4) tickets to the PCFB Harvest Celebration in May 2017. ($400 Value). Premier listing on sponsor signage displayed at PCFB events and other industry gatherings. Farm Bureau membership for two people in the company. Recognition in periodic issues of Polk’s Agriculture Magazine, Central Florida Ag News, mailed monthly to all PCFB members and available at more than 650 locations. Up to three (3) “SPONSOR NEWS” community share postings on PCFB website and Facebook page. Prominent listing as sponsor displayed at Polk County Farm Bureau’s events and other industry gatherings. Two (2) tickets to the PCFB Harvest Celebration in May 2017. ($200 value). Recognition in periodic issues of Polk’s monthly Agriculture Magazine, Central Florida Ag News, mailed monthly to all PCFB members and available at more than 650 locations. One (1) ticket to the PCFB Harvest Celebration in May 2017. ($100 value). Farm Bureau membership for one person in the company. 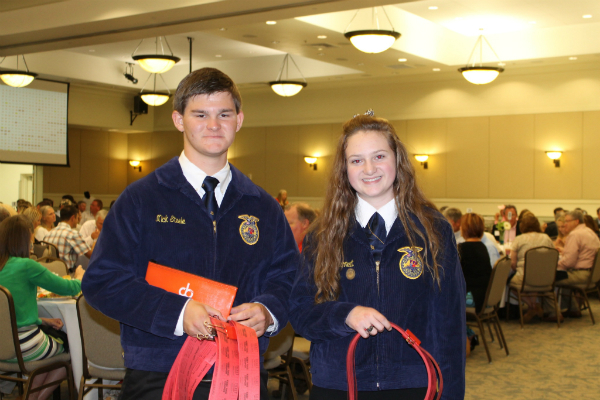 Sponsor listing displayed at Polk County Farm Bureau’s events and other industry gatherings. AGRI-FEST SPONSOR—$250: Sponsors contributing to this event will help off-set the costs of educating approx. 6,000 Polk County 4th Grade Students about Agriculture during the March 2017 10-day event. HARVEST CELEBRATION TABLE SPONSOR—$1,000: Harvest Celebration Table Sponsors who confirm by March 1st, 2017 will receive Ten (10) tickets to the event ($1,000 value) and recognition in the event signage and program at the May 2017 event. 2017 HUNGER SHOOTOUT (Young Farmer & Rancher and Women’s Committee Sponsorship) Stay tuned for sponsorship and participation information in this Fall 2017 event. Proceeds from this sporting clay event support YF&R Scholarships to graduating high school seniors pursuing a career in Agriculture, and, the Wild Game Food Bank to feed local community members in need.